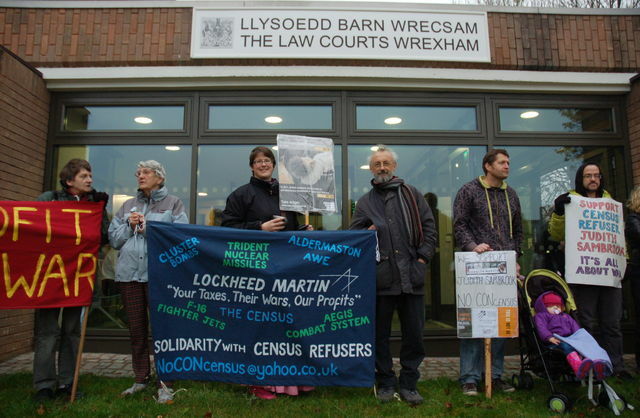 ” People started to gather outside Wrexham Magistrates Court from about 9.30am this morning in solidarity with conscientious census objector Judith Sambrook. 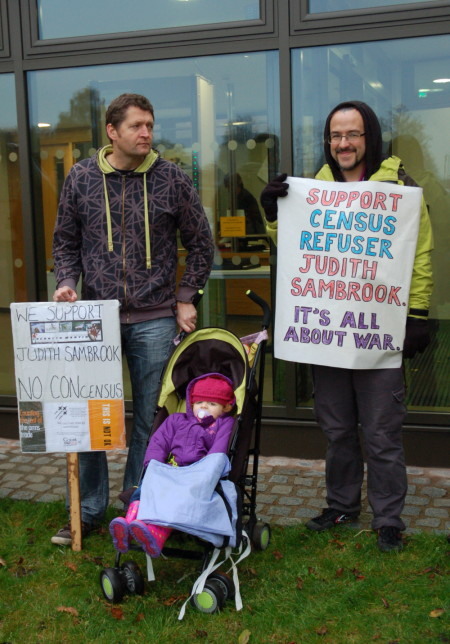 Judith’s census refusal stems from the involvement of WMD manufacturer Lockheed Martin in processing the data from the 2011 census in England and Wales. 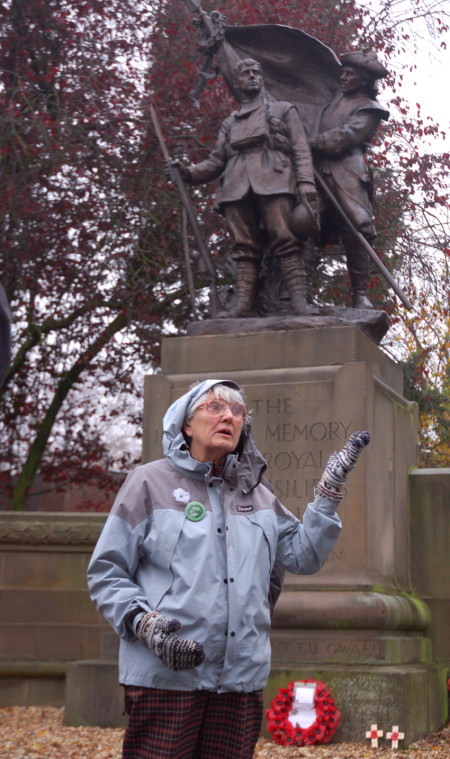 This was very much an anti-war demonstration and, with the case being heard on Remembrance Day, most of the 25 supporters were wearing white peace poppies on their lapels. Placards and banners pointed out Lockheed Martin’s deadly business, called for solidarity with Judith and all census refusers, and for an end to wars everywhere. Around 25 people took part, from Wrexham, Flintshire, Shropshire, Wirral, Liverpool and beyond. Some maintained a presence outside the court for the duration of the hearing, while others went into the court to support Judith. Our presence outside the court seemed to cause consternation inside. Security were sent out soon after 9.30am to try and move us from our prominent but sheltered spot right in front of the court to a windy patch of grass opposite. A bit put out that no one was ‘in charge’ of the protest, the security guard quickly moved from asking, to ordering, to threatening us with the cops. Having established that the court had no immediate plans to use the bit of ground we were occupying for a function, end of season garden fete or suchlike, we pointed out its advantages and individually expressed our intention to stay. He said he’d been briefed from ‘above’ that we had to move, muttered darkly that we wouldn’t want children to be caught up in police action against us, would we? and retreated inside. A while later, and after some CSOs had cheerily assured us we were fine where we were, a cop turned up and did a similar ‘move or else’ routine. None of us obliged, which prompted the Sergeant from Wrexham Police Station next door to pay a visit and tell us that ‘the court’ (whoever that is) would like us to move. In fact, it wanted us to move. He appealed to us to be reasonable, which in his view meant that we would agree to stand where ‘the court’ wanted us to stand, across the way. We said we’d move when we were finished, so he went back inside, consulted and came back out smiling to tell us we could stay after all thanks to the court’s reasonableness. I think we were supposed to be grateful. Judith was an hour late, courtesy of a cancelled Arriva train. While we were waiting we passed the time handing out flyers to passers-by, speaking with a number of local journos who had turned up to cover the story, and reading out all the messages of solidarity from British well-wishers, including many from Occupy London Stock Exchange and Finsbury Square, from Canada (where Lockheed Martin also has a census contract) and beyond. 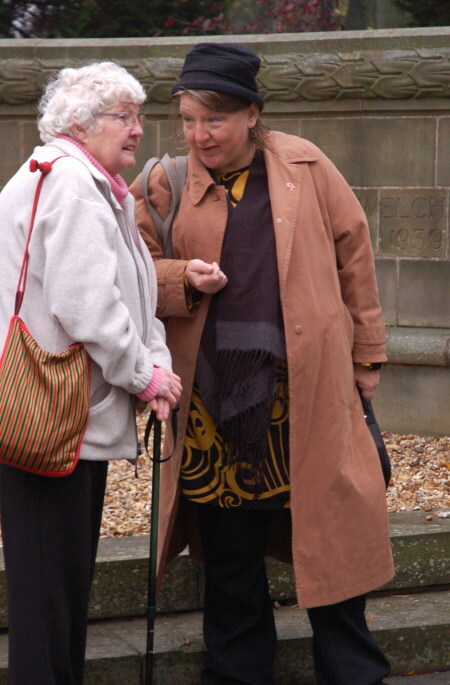 Inside the court, Judith entered a plea of not guilty and the case was adjourned until 8 December, when it will be heard in Mold Magistrates Court, Flintshire, even further away from Judith’s home in Shrewsbury and involving both a train and long bus journey (NB this date and venue could change). 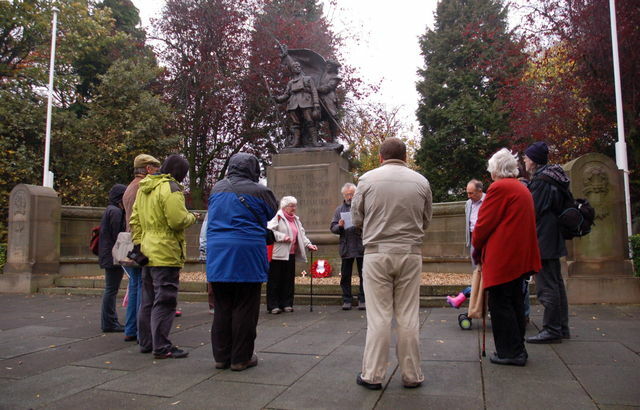 Although we’d planned to observe a silent vigil at the war memorial at 11am, in the event we were still at the court, so we held the vigil there instead. Those who were able to stay longer then moved to the war memorial, where we held a further two minutes of silent reflection in a circle before sharing information about Lockheed Martin’s deadly business, thoughts about Judith’s case, white poppies, Remembrance Day and the impact of war. 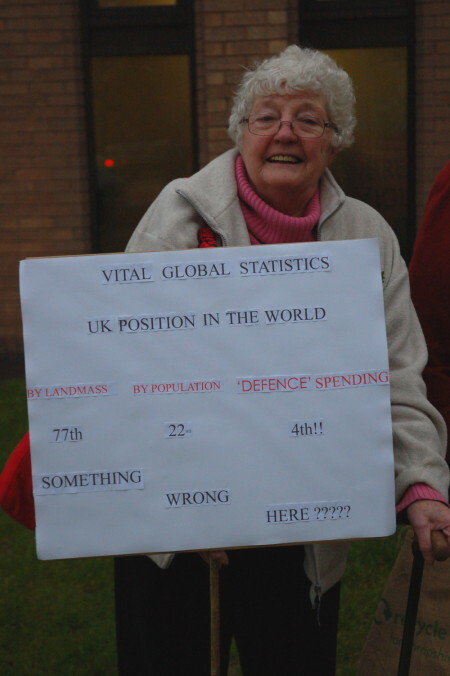 Joan Meredith spoke about the need to oppose drone warfare and about the protest camp at Waddington in Lincs. Judith spoke about her reasons for refusing to comply with the census, about how David Cameron’s idea of a ‘Big Society’ was looking set to backfire on him big time, and thanked everyone for their support and solidarity. maximum compliance with the census. on anytime, any place on the planet”. that this company is somehow completely separate from the US parent company. citizens of the British Isles! major influence on LM getting the census work! sinister security world of intelligence and surveillance. now we do this ourselves in a much more detailed and comprehensive manner. immunity from further prosecution in respect to paying bribes. non-contentious UK company cannot perform all of the census processing work, i.e. privately regret the decision to award the contract to this company? 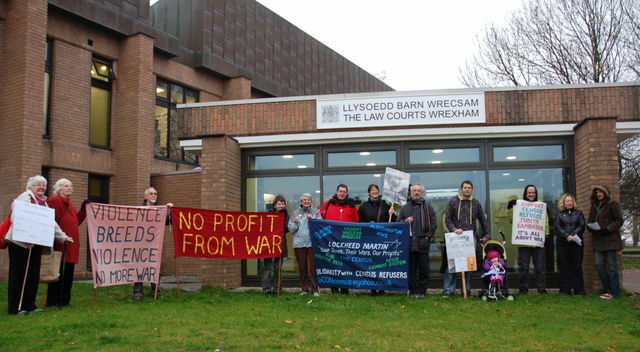 ” Judith Sambrook is due to appear in Wrexham Magistrates court on Remembrance Day, Friday 11/11/11. She’s being prosecuted for refusing to cooperate with the 2011 Census in protest at the involvement of deadly arms manufacturer Lockheed Martin in processing census data. There’ll be a demonstration outside the court from 9.30am and a silent vigil at the war memorial at 11am. If you’re not able to be there in person, please consider sending a message of solidarity to Judith. Messages can be sent to NoCONcensus[at]yahoo.co.uk. ASSEMBLE 9.30am OUTSIDE WREXHAM MAGISTRATES COURT on FRIDAY 11 NOVEMBER. Note change to original start time. As this is also Remembrance Day, we will hold a silent vigil at 11am at the war memorial, which is just 50 yards from the court. Please join us for the morning if you possibly can. Contact us if you need accommodation the night before. Address: Bodhyfryd, Wrexham LL12 7BP. Transport: 5 minutes walk from bus station, 10 minutes walk from either train station. Car parking right outside, access from Chester Street (swimming pool car park). Direct train services from Chester, Deeside and the Wirral, North Wales coast, Shrewsbury and Birmingham. Wrexham is 12 miles from Chester, 30 miles from Liverpool and 40 miles from Shrewsbury. Lockheed Martin manufactures F-16 fighter jets, as used by Israel to murder civilians in Gaza during Operation Cast Lead in 2009. Lockheed Martin developed and manufactured Britain’s Trident nuclear missiles and has a £5.3 billion contract with the UK government to design and build new and illegal weapons of mass destruction at Aldermaston Atomic Weapons Establishment. Lockheed Martin has developed the ‘Aegis Combat System’. The US is pressurising South Korea to site Aegis-fitted destroyers at a planned naval base on Jeju Island, South Korea, a Unesco-designated ecological area, in a move which will fuel the arms race in the region and will be seen by China as extremely provocative. Local peace activists and others have been resisting this development for years, with many detained for occupying the proposed base. Lockheed Martin also manufactures cluster bombs, sells arms to Bahrain and makes surveillance drones used by the UK in Afghanistan.